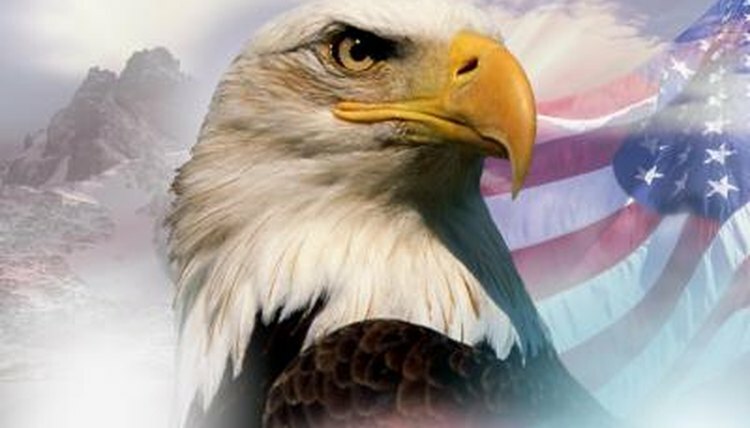 The American eagle is as much a symbol of the United States as the Stars and Stripes and Uncle Sam are. There's probably a picture of this magnificent bird of prey in your wallet or your pocket -- it's on U.S. quarters and dollar bills. This large raptor, once threatened with extinction, now appears in significant numbers, especially in Alaska and Canada. It was removed from the endangered species list in 2007. Bald eagles aren't actually bald like vultures. Instead, their heads -- and tails -- are white. Young eagles don't develop the white feathering on their heads until the age of 5. Younger birds might have some white markings on the chest or underneath the wings, but the rest of their feathering is brown. As the bird gets older, his bill turns from brown to the classic gold coloring. At maturity, bald eagles stand between 2.5 and 3 feet tall and weigh 6.5 to 14 pounds. Their wingspans range from 6 to 8 feet. Females are larger than males. The bald eagle's natural range spans from Mexico to Canada. Their preferred habitat is along large rivers with forested embankments. Besides Alaska, where they're quite numerous, bald eagles can be seen along the mighty Mississippi River and in the Rocky Mountains. In the wild, bald eagles live between 20 and 30 years. Captive-bred eagles, facing fewer threats, tend to live longer. Although wild eagles are a protected species, many succumb to poisoning from pollutants and toxic substances. Because of exposure to the pesticide DDT in fish, their favorite meal, bald eagles almost became extinct in their natural habitat. DDT causes weak eggshells, so eaglets didn't hatch. Bald eagles mate for life, pairing up around age 5. Most eagle couples stay together long enough to celebrate their silver, or 25th, anniversaries. The female produces between one and three eggs annually, with a 35-day incubation period. After hatching, baby eagles live in their nests for slightly less than three months. Parents might return to the same nest year after year. Their nests can be quite large, as befits these big birds. According to National Geographic, the largest bald eagle nest on record was 9.5 feet wide and 20 feet high, weighing more than 2 tons. Because bald eagles prefer living near rivers, it's not surprising that fish is their favorite food. They also catch rodents and birds in their large talons, and they munch on carrion they find. They're true carnivores, not eating plant materials. They're also known for "mugging" the kills of smaller predators.